Nearly 1,300 migrants are stuck in dire conditions at the Serbia-Hungary border after Hungary blocked their entry, the UN's refugee agency says. 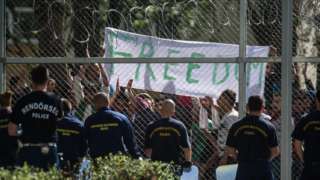 The UNHCR criticised Hungary, which said it had deployed 10,000 police and soldiers to seal the border. The agency says it is concerned that migrants are being illegally forced to return from Hungary to Serbia. The numbers of migrants travelling through the Balkans is again on the rise, according to the UN. Serbia's government accused Hungary of breaching international law by returning the migrants. UNHCR regional spokesman in Budapest, Erno Simon told the BBC he is deeply concerned about the practice and the increasingly dangerous conditions for those at the border. The UN says close to 800 migrants are in the open on the Serbian side of the border, lacking shelter and sanitation. A 10-year-old Afghan boy died in a drowning accident at Horgos near a makeshift tent encampment on Thursday. On Friday, the Serbian government called an emergency meeting after 500 migrants entered the country from Bulgaria and Macedonia in 24 hours. With the Hungarian border now effectively closed, all new arrivals in Serbia will either have to stay there, or find new routes to continue their journeys to western Europe. The sharp increase in border security by Hungary's armed forces follows a hardline anti-immigration stance taken by Hungary's government. Janos Lazar, chief of staff to Hungarian Prime Minister Viktor Orban, said on Friday: "Today, the protection of Hungary and of Europe is the government's task. "For Hungary, security is the most important question. Stopping illegal immigration is a key issue." Hungary says those caught near the border and returned can claim asylum at transit zones on the border, but reports said only 30 people a day were being allowed through to file claims. Nearly 400,000 migrants passed through Hungary last year, but just over 500 were granted some sort of international protection here. More than one million migrants used the Balkan route to cross to Western Europe before it officially closed in March.